So there was mom/dad rolling down the street doing their errands one weekend. They stop at a stoplight. Mom looks over and says, “WTP”. Dad of course is like what? 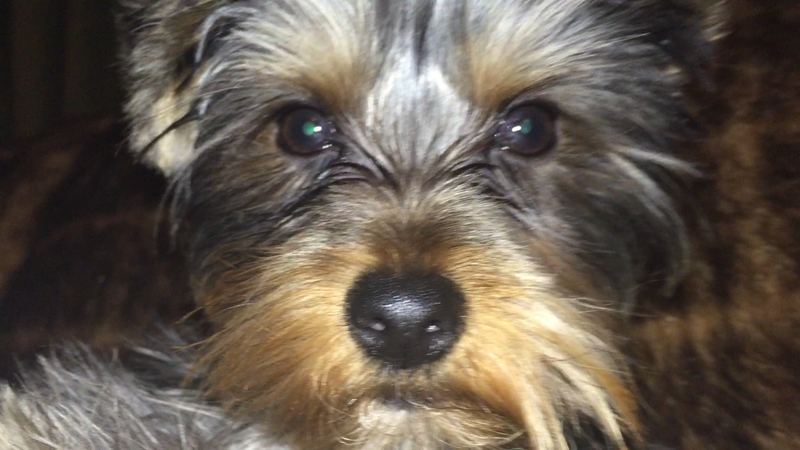 Mom says, “Give me the camera – Give me the camera – I gotta take a picture of this”. Okay that kind of statement means Trouble with a capital T. It can’t end well – I’m just telling you my friends. I’ve been around mom long enough to know there will be a blog posting coming from those words. So mom proceeds to click off a couple of pictures to dad’s continuous, “What’s going on?” Mom told dad he wasn’t going to believe what she just witnessed – it was scarier than she could put into words – it was unfathomably – aliens surely had to have something to do with this – it was that BIG. So for your visual understand, I blew the picture up. What did I tell you? Scary huh? 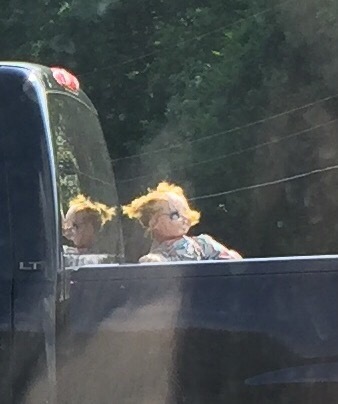 That is CHUCKY tied to the back of a pick up truck. You know there’s a good story behind that! So there was mom/dad rolling down the street in their Jeep doing their errands one weekend. They stop at a stoplight. Mom looks over and says, “WTP”. Dad of course is like what? Mom says, “Give me the camera – Give me the camera – I gotta take a picture of this”. Yawns. Welcome Bacon’s friends to *my* first Paw Time with Houdini. 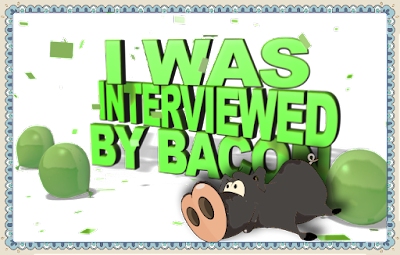 Bacon has so graciously allowed me a weekly spot on his blog to get to know all of you and vice versa. Isn’t he the best!? So every Friday afternoon, I will get a chance to write a little something from my heart. This week, I wanted to introduce myself and talk about life here at the Hotel Thompson so far. I’ve been here four months and I have to say that this is home. It feels home surrounded by love. Bacon, Hemi and Mouse Girl have all so graciously welcomed me here into their lives. Although we have all been adopted, you would never tell with mom and dad. They treat us just like their own and love us all. Lots of things and firsts have happened. Recently, I was abducted by aliens. Can you believe that? I’ve watched television shows in Bacon’s bedroom on his television about these aliens. They abducted me right before Christmas and left weird markings on my belly. Mommy says that tomorrow I go and get these stringy things out called stitches. They have itched me like crazy! So much so that I have had to wear this cone of shame thingy. But don’t feel to sorry for me. I make this cone! Well that’s what daddy tells me and I ❤ my daddy. These pictures shows it – barks. And this cone doesn’t slow me down one single bit. Not at all. I run around still like there’s no tomorrow. Life here at the Hotel Thompson is easy, great and fun. There’s lots of love and cuddles and food and fun and toys. I get so excited about all of it. Well – yawns – until next time my new friends. Take care and have fun! No my friends. You did not read that wrong – Goats on a Roof is a real place – snorts. I can say for one time that it doesn’t say Pigs on a Roof – shivers. If it did, mom would have me on a side show – double snorts. This past weekend, mom/dad took a day trip to the mountains. They have seen this place in Tiger, Georgia so many times in the past but have never stopped to check it out. 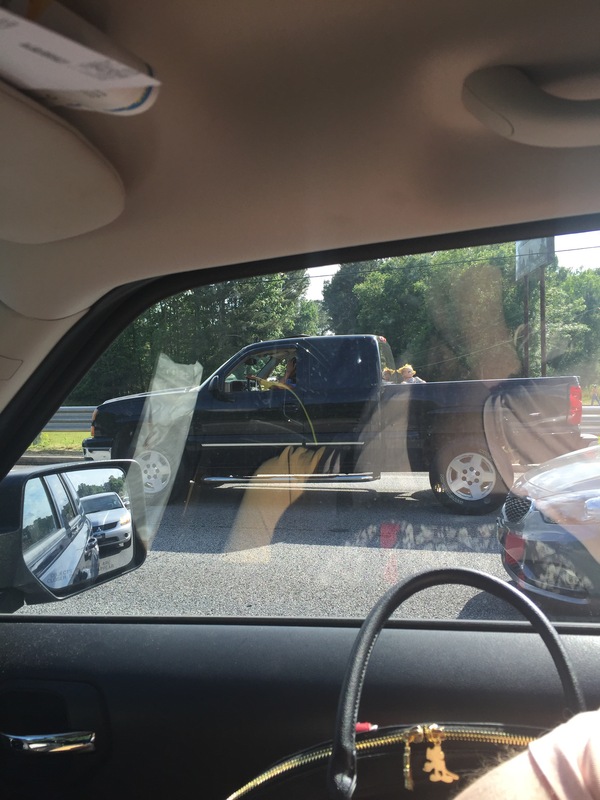 They decided to stop and that’s when the comedy started… well we are talking about my mom/dad. There’s always comedy when those two go out unchaperoned. 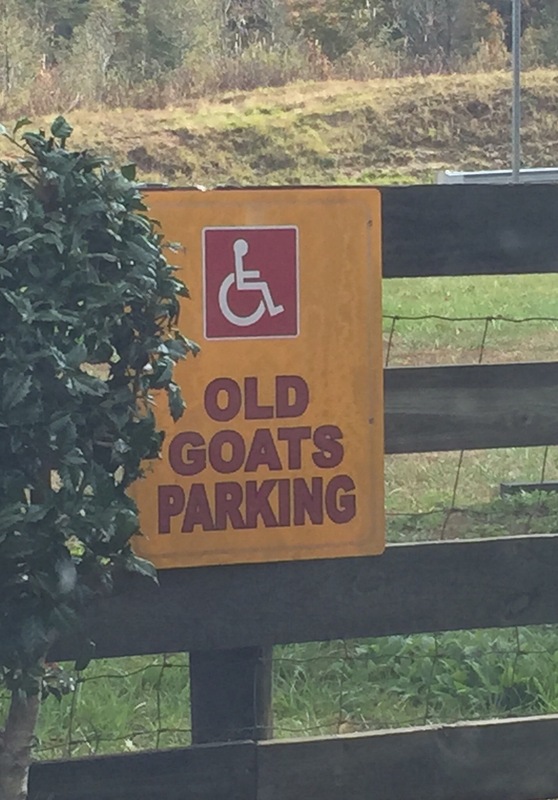 First they pulled in and saw this sign to the left, “Old Farts Parking”. Since mommy had daddy in the car, she parked there – HA! Now just to show you that I’m serious about this actually being an establishment, I’m going to link their web page here. Check it out – then you will know I’m telling you the truth. Now you are probably asking yourself, “Self, why are there goats on the roof?” And I’m glad you are talking to yourself and wondering… and that you are not getting answers because then that would be just scary. Supposedly Rabun County’s goat whisperer Uncle Buck talked to the goats once upon a time. They believe… come closer I don’t want to say it too loud… they are descendants of Aliens. What?! Really?! 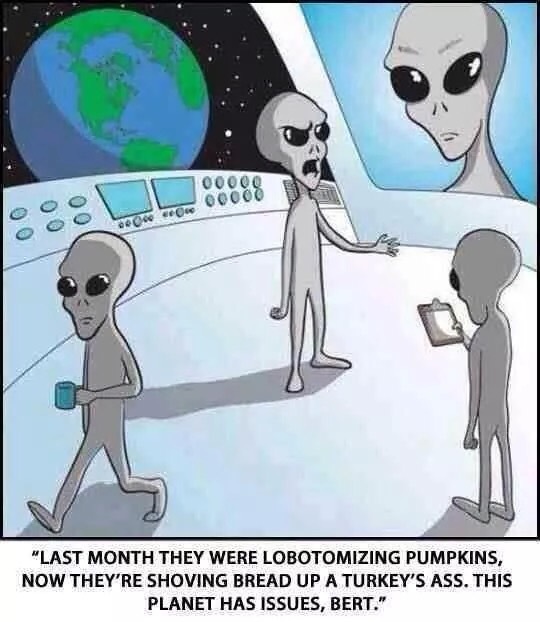 Aliens? Okay. Sure… walks away slowly from the goats. When you are at this business, you can even feed the alien goats some goat chow. After buying some of course, you walk up some stairs where there is a little pulley system rigged up. You put the goat chow in a bucket and then pull the pulley system until it gets to the other side of the building where the alien goats are waiting ever so patiently for their mother ship of the goat universe to come down (their words not mine – snorts). The bucket dips and the goats get their food. Yay! Something to keep them occupied until the next “mother ship” makes it back. Now, it’s a neat place to go and visit. Mom even got to try some delicious food that you just won’t believe until you see the pictures. The pictures will be on her blog here today as well. Good tag team today between me and mom huh? Now here’s something that is crazy. 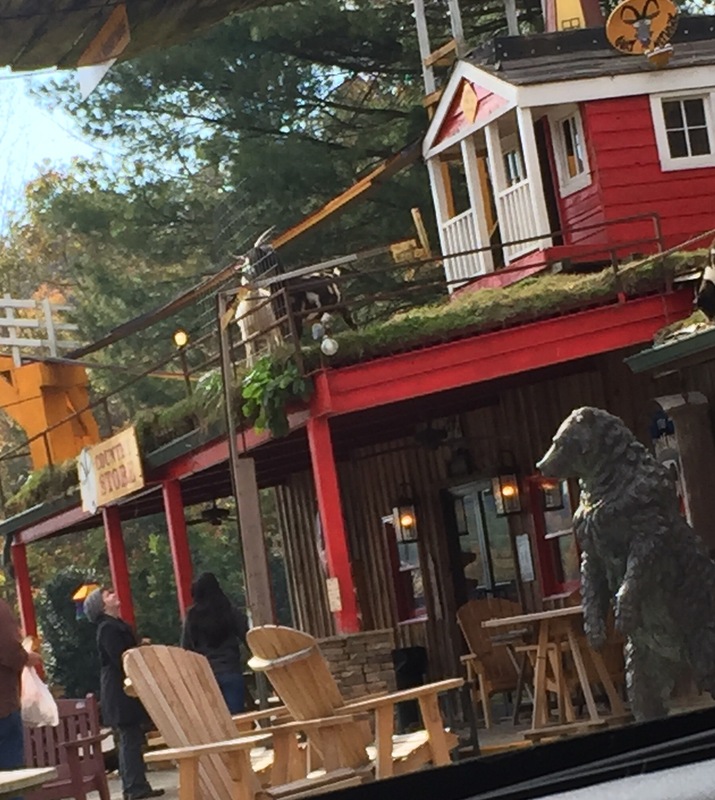 Mommy snapped this picture to the left – notice the two goats on top of the building. As soon as she finished, one of the goats fell off – WHAT!? I’m not sure if the other goat pushed it, it tried to bungee jump or an invisible alien came down to visit. But the goat fell off the building onto the ground. Now the place is called GOAT on the Roof. Snorts. No really the goat is fine. He got up, brushed himself off, looked around and then started begging for more food.Goat is good.